I am testing the cairo drawing library. I modified the transparency test program from my last blog post so, that it paints an avatar image with nickname instead of the pattern from the last blog. I can move the avatar around and positioned it on top of a browser window. The result looks like there is an avatar standing on the browser - looks like everything is ready. But it's just a fake avatar. It is static, not animated, not from a chat room. 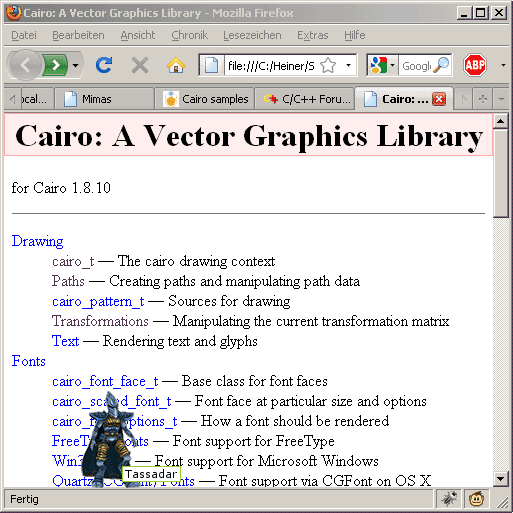 It is just an image painted on a transparent window with the cairo drawing library. But as a cairo test, it is quite successful. Painting graphics with cairo feels really backwards for us web programmers. We are used to markup: HTML, SVG, and XAML. Programming with "hard coded" functions like cairo_move_to, cairo_set_line_width and cairo_fill feels odd. No CSS, no div, no img-tag. Just good old C++ code with function calls. OK, so, cairo works. The image above is only a fake. It is still a long way to go, but we are on the way.